Pine siskins, a species of seed-eating boreal bird, will spend some winters in the pine, spruce and fir forests of Canada, and then arrive at bird feeders much farther south during others. Ornithologists suspected the irregular migrations tracked oscillating climate patterns, but a direct link was elusive, until now. Why do certain birds suddenly leave their winter territory -- sometimes in the middle of winter? The more familiar, "seasonal" migration is triggered by changes in day length, and birds tend to fly south in winter. But what sparks this "facultative" migration, with its dense "irruptions" of hungry birds that often fly hundreds of kilometers in various directions? 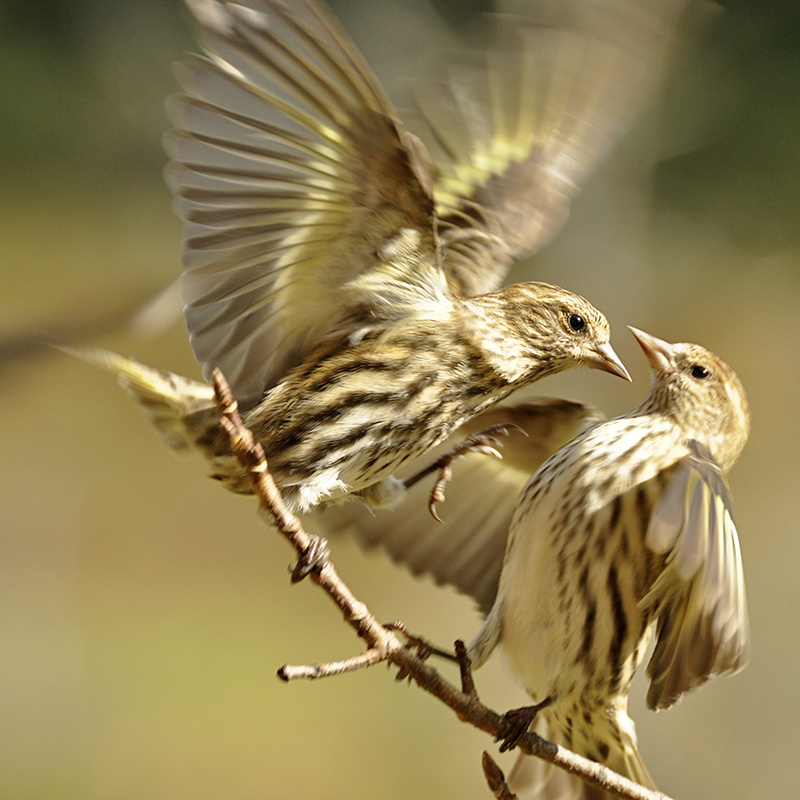 During an irruption, the pine siskin may abandon its wintering turf in Canada and fly south, east or west across Canada's vast boreal forest. Siskins in the Appalachian Mountains may fly northeast or southwest, paralleling the mountain range. "This happens, in some cases, every other year, or every few years," says Benjamin Zuckerberg, an assistant professor of wildlife ecology at the University of Wisconsin-Madison. "In the 'superflight' years, you get multiple species irrupting out of the boreal forest and showing up at feeders, in really large numbers." Hunger is a clue to these migrations, and the pine tree's cycles of fruit production -- called "masting" -- explains that hunger. In a "mast" year, the trees produce a heavy crop of seeds and the birds reproduce well; in lean years, the crop may be nearly nil, and the birds must leave or starve. The coniferous forests of boreal Canada and northern U.S.support many populations of the pine siskin with year-round seeds. 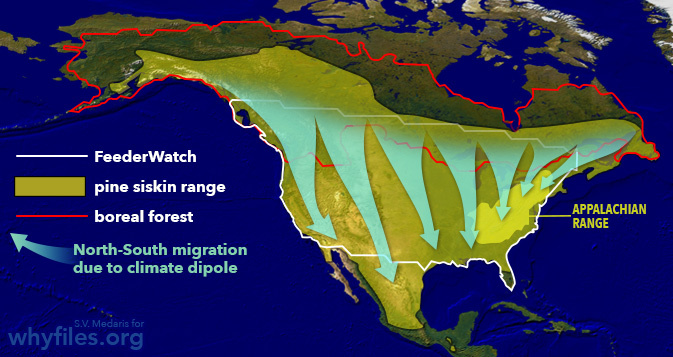 Occasional “swings” in the North American dipole, though, lead to irregular migrations of pine siskin to more southerly forests and bird feeders. Mast years, in turn, usually follow a warm and/or dry year, and so climatic swings set the schedule. And masting, by leading to those hungry years, could explain facultative migration. To explore what drives facultative migration, a new study1 in the Proceedings of the National Academy of Sciences, based on citizen-scientist observations at bird feeders, viewed climate in terms of "dipoles." These contrasting regions (of high and low temperature, or heavy and light precipitation) affect seed production and therefore bird populations and migration. And that helps explain why pine siskins are common in some years and absent in others, and why they occasionally throng feeders where they are seldom seen. The math was complicated, but the bottom line was that climate explained 58 percent of the north-south movement, and also 58 percent of the east-west movement. Curiously, the patterns of precipitation and temperature in the dipoles "stem in part from thunderstorms in the Asian monsoons during the warm season," says first author Courtenay Strong, an assistant professor of atmospheric sciences at the University of Utah. "That creates atmospheric wave patterns that cross the Pacific and contribute to the dipole." Coniferous trees, like this cedar, often brim with seeds and nuts during “mast” years marked by favorable climate. 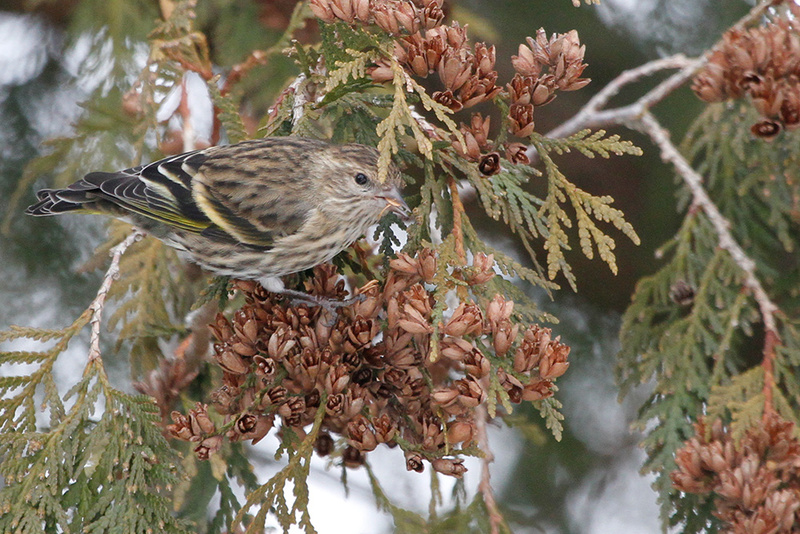 Pine siskins will leave their usual stomping grounds to follow productive trees. Citizen science data from Project FeederWatch aided this study by providing over 2 million pine siskin observations, many from backyard bird feeders around the U.S.
Meteorologists and climate scientists are used to wading knee-deep in data, but the citizen-science movement is helping envious biologists catch up. 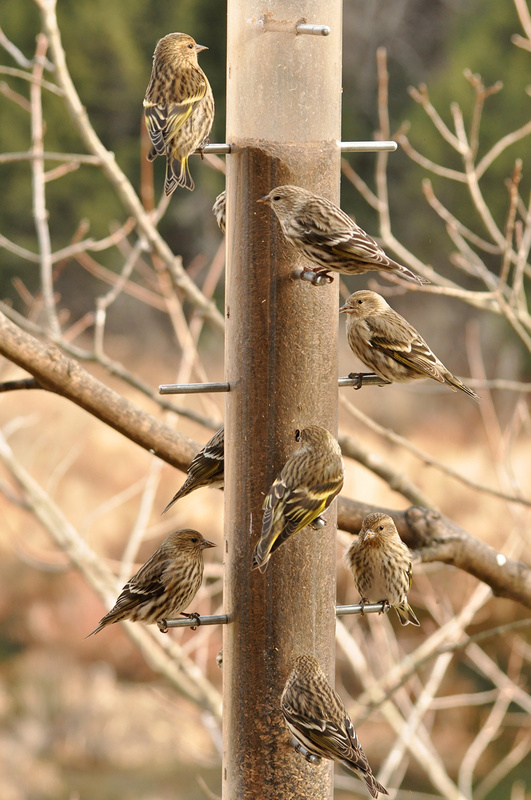 The irruption study, for example, rested on more than 2 million amateur observations of pine siskins through Project FeederWatch. "Citizen science is absolutely critical for being able to document these patterns," says Zuckerberg, another author of the PNAS paper. "It plays right into the strengths; it's a very noticeable biological phenomenon, people are logging at their feeder and seeing dozens or hundreds of siskins descending. They know when an irruption year is taking place." 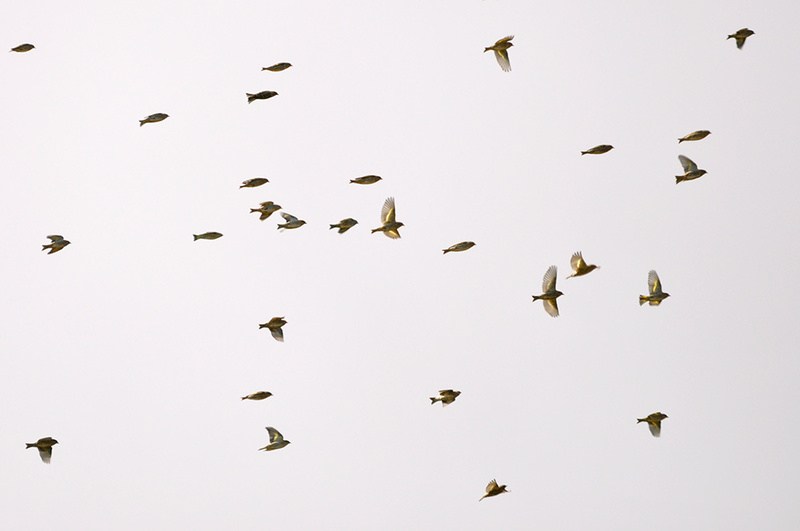 A flock of Pine siskin near West River Trail, Brattleboro, Vt. Although citizens and scientists have long recorded the signs of spring, "Documenting, quantifying the nature of irruptions is something we have always wanted to do in ecology," says Zuckerberg. "This is the first time we have been able to document this, and could disentangle the role of climate on the irruptions." The study also entailed a different perspective for climate scientists, who usually focus on how weather patterns affect people. "When we start looking at problems that affect birds, we are looking at phenomena that we have not paid as much attention to in the past," Strong says. Because the dipole phenomenon seems to be increasing as the climate changes, the new study "offers a lot of implications for seeing how climate change is going to affect the boreal forest and its constituent species," Zuckerberg says. Although we can understand the "push part" (why birds fly to flee a territory that can't feed them), how do they locate better habitat? "The pull part is tougher to get a handle on," Zuckerberg agrees. "Are they sampling the environment as they make the sojourn? Are they cueing in on other birds? Those are certainly possibilities."